Vendo Drink Machines are made at the Vendo Company, founded in 1937 and has come out with many innovations that now exist in nearly every snack and beverage vending machine today. The Vendo company is now in Dallas Texas and is the primary manufacturer of stack drink vending machines. 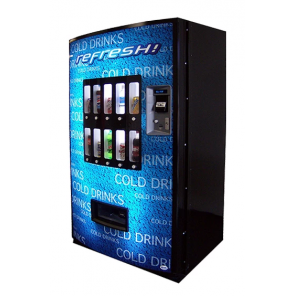 Vendo drink Machines can vend a variety of drinks from 12oz cans up to 24oz bottles. The Vendo new drink machines come with one of the best warranties in the business. We provide both new and refurbished Vendo machines with anti theft Lexan sign or live displays. 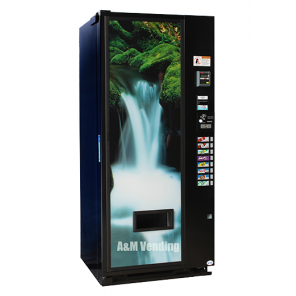 These soft drink machines are great for small, medium and large locations and all come with FREE telephone tech support for as long as you own the machine.A&M has been an authorized Vendo distributor for the pat 20 years and have parts readily available. All parts that are ordered before 12pm est can be shipped out same day if available.